OXFORD CONCERT ANDREAE/LASH/ULLÉN + MEDLEY/MCPHAIL/GUASTALLA | who's that knocking...? 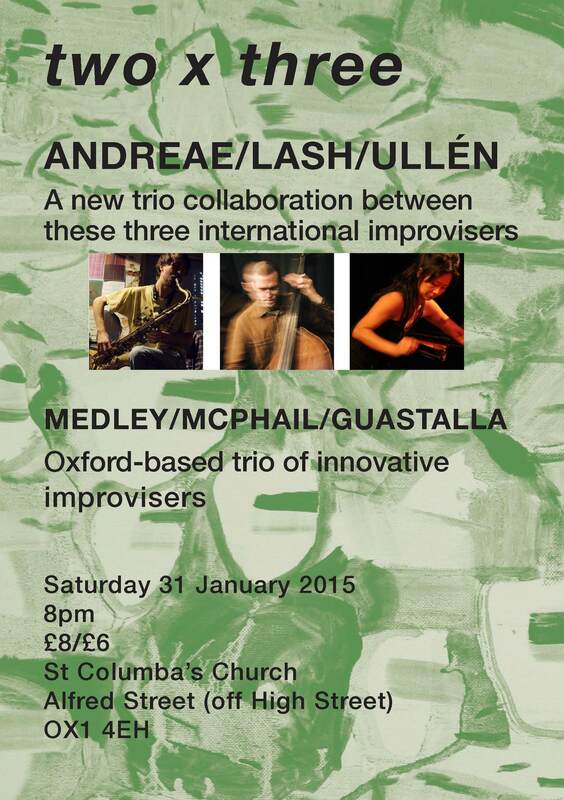 A new trio collaboration between these three international improvisers, part of their UK tour. Lisa Ullén is one of the most distinguished artists on the Northern European contemporary art-music scene. Born in Seoul, South Korea, Ullén grew up in a quiet small town in northern Sweden. A graduate from the Royal Musical Academy in Stockholm, Ullén studied jazz piano at the University of Chapel Hill, North Carolina. Dominic Lash is a freely improvising double bassist, although his activities also range much more widely and include playing bass guitar and other instruments; both writing and performing composed music; and writing about music and various other subjects. Based in Bristol, Lash has performed in the UK, Austria, Finland, France, Germany, the Netherlands, Norway, Spain, Switzerland, Turkey and USA. For nearly a decade he was based in Oxford and played a central role in the activities of Oxford Improvisers; much of 2011 was spent living in Manhattan. In 2013 & 2014 he is taking part in Take Five, the professional development programme administered by Serious. Sam Andreae is a musician active as an improviser and composer in the UK and Scandinavia. Currently living in Manchester, Sam approaches improvisation through the exploration of sound and abstract noise, developing extended uses of the saxophone both acoustically and through electronic augmentation. Originally trained as a classical musician he has developed his own musical voice through varied experiences in improvised, jazz and noise music.Sam has had the pleasure of recently performing with: Le Quan Ninh, Lisa Ullén, Christian Wolff, Julie Kjaer, Michael Duch, Daysuke Takaoka, Rachel Musson, Darren Moore, Tatsuhisa Yamamoto, David Birchall, Mette Rasmussen, Corey Mwamba, Alex Bonney, Kelly Jones, Olie Brice, Colin Webster, Rodrigo Constanzo, Anton Hunter, David Meier, Marlyn Crispell, Trio Riot, Silence Blossoms, Distractfold Ensemble and Strikethrough Me & You. Paul Medley is an Oxford based improvising musician who plays clarinet, bass-clarinet and tenor sax. Paul has played in several UK based groups, including AMV and Ensemble Azut. He is currently the chair of the collective Oxford Improvisers. Pete McPhail’s international career started in the 80’s, He plays sax, flute and alto flute, He is a founding member of the London Jazz Composers Orchestra, he has composed extensively for the theatre and collaborated with dancers throughout his life. Bruno Guastalla is an instrument maker and musician who plays cello and bandoneon. He has been involved in a variety of collaborations (Set Ensemble, Oxford improvisers, Azut, MUE, ). This entry was posted in diary, events, improvisation, music and tagged cello, collaborations, Dominic Lash, improvisation, music, oxford improvisers, Paul Medley, Pete McPhail. Bookmark the permalink.